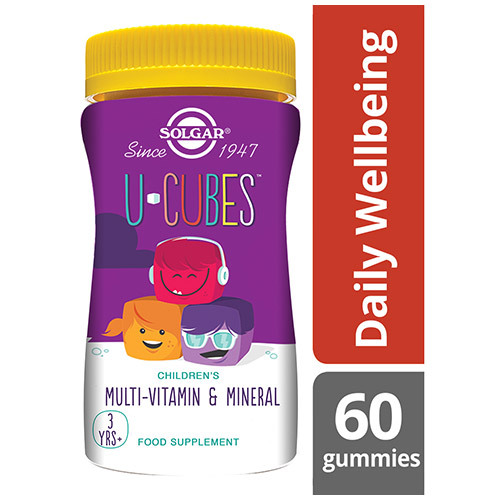 Solgar® U-Cubes Children`s Multi-Vitamin and Mineral Gummies is a specially formulated multi-vitamin in a chewable form, having both parents and kids in mind. And best of all, they’re from Solgar. 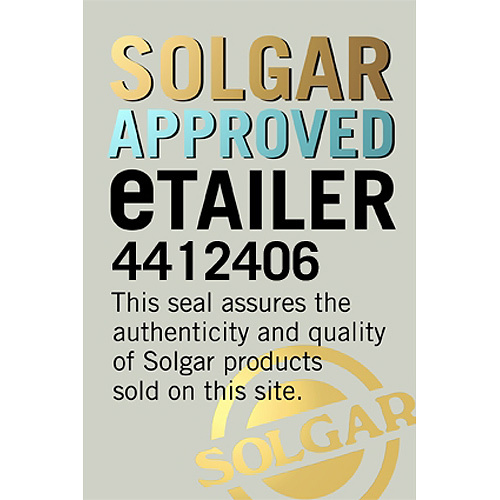 Solgar has been crafting nutritional supplements for generations—over 70 years. And, just like all our supplements, U-Cubes™ benefit from all the science and knowledge behind our name. 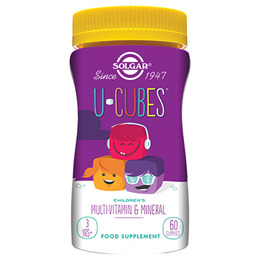 U-Cubes™ are a delicious way to give your children the nutrients they need for proper development. Sweetener: cane sugar; Bulking Agents: tapioca syrup, maltodextrin, mannitol; Gelling Agent: pectin; Flavour Enhancer: citric acid; Magnesium (as citrate), Calcium (as tri-calcium phosphate, dicalcium phosphate), Vitamin C (as L-Ascorbic acid), Colours: purple berry concentrate, black carrot juice concentrate, turmeric; Zinc (as citrate), Vitamin E (as D-alpha tocopheryl acid succinate), Natural Flavourings: grape, cherry, orange; Anti-caking Agent: silicon dioxide; Pantothenic Acid (as D-pantothenate, calcium), Vitamin B6 (as pyridoxine HCI), Vitamin A (as retinyl palmitate), Folic Acid (as pteroylmonoglutamic acid), Iodine (as potassium iodide), Inositol, Vitamin D3 (as cholecalciferol), Vitamin B12 (as cyanocobalamin). As a food supplement for children 3 to 5 years of age, two (2) gummies daily, for children aged 6 years plus, four (4) gummies daily, preferably at mealtime, or as directed by a healthcare practitioner. If you are pregnant, nursing, taking any medications, including blood thinners, planning any medical or surgical procedure or have any medical condition, please consult your healthcare practitioner before taking this product. 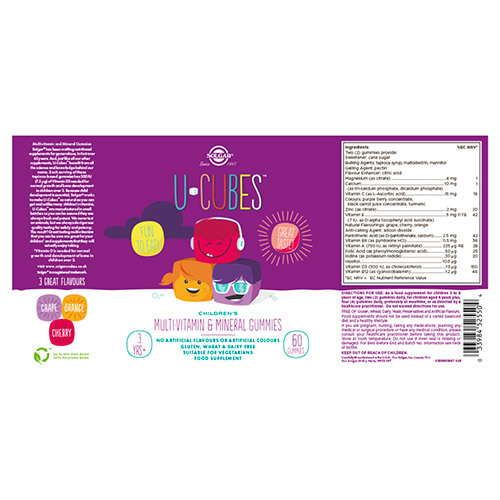 Below are reviews of Solgar U-Cubes Children`s Multi-Vitamin - 60 Gummies by bodykind customers. If you have tried this product we'd love to hear what you think so please leave a review. Toddler fussy over all types of vitamins and loves these. Also these keep fresh smell in contrast to other types of gummy vitamins that let off a rotten egg smell everytime you open the bottle. My daughter has Coeliac's disease and needs extra vitamins to supplement her diet. She loves these and I love the fact they have no artificial sweeteners. I prefer her to have sugar! This is one of the best vitamins for children!!! I strongly advise for all children. My grandchildren think that the Solgar U-Cubes are fantastic..They love taking their vitamins now..
My son loves these and thinks they are a real treat!